"Allan Levey (left) and Rob Breiman (right) represent two of Emory's greatest strengths — the neurosciences and global health," says Jonathan S. Lewin, MD, executive vice president for health affairs, Emory University; executive director of the Woodruff Health Sciences Center and president, CEO, and chairman of the board, Emory Healthcare. "Their lifelong accomplishments have led to longer and better lives for thousands of people in the U.S. and abroad." 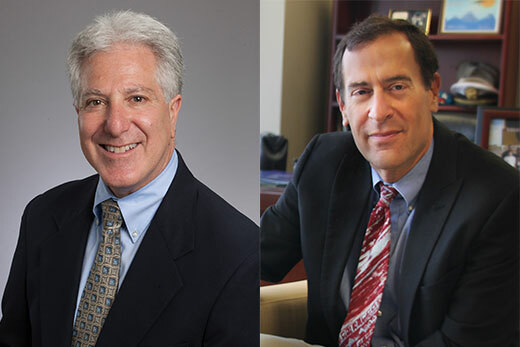 The National Academy of Medicine (NAM) has elected Allan I. Levey, MD, PhD, and Robert F. Breiman, MD, to its 2017 class of leading health scientists and international members. Levey is a neurologist and neuroscientist internationally recognized for his work in neurodegenerative disease. He is professor and chair of the Department of Neurology at Emory University School of Medicine, the Goizueta Foundation and Betty Gage Holland Endowed Chair for Alzheimer's Disease Research, and director of the NIH-funded Emory Alzheimer's Disease Research Center. Breiman is director of the Emory Global Health Institute and professor in Emory's Rollins School of Public Health. An infectious disease epidemiologist, he has led research programs in a variety of urban and rural surveillance systems, and is former director of the Kenya office of the US Centers for Disease Control and Prevention, the CDC's largest overseas field operation. Membership in the NAM, formerly the Institute of Medicine, is considered one of the highest honors in the fields of health and medicine, recognizing individuals who have demonstrated outstanding professional achievements and commitment to service. Current active members elect new members from among candidates nominated for their accomplishments and contributions to the advancement of the medical sciences, health care and public health. "Allan Levey and Rob Breiman represent two of Emory's greatest strengths – the neurosciences and global health," says Jonathan S. Lewin, MD, executive vice president for health affairs, Emory University; executive director of the Woodruff Health Sciences Center and president, CEO, and chairman of the board, Emory Healthcare. "Their lifelong accomplishments have led to longer and better lives for thousands of people in the U.S. and abroad." Allan Levey is a board-certified neurologist whose research has contributed to understanding the pathogenesis of Alzheimer's disease and related disorders, and in identifying novel molecular targets. He has more than 350 research publications. In addition to chairing the Department of Neurology, Levey holds faculty appointments in the Emory Departments of Psychiatry and Behavioral Sciences and Pharmacology. He is interim executive associate dean for research administration in Emory School of Medicine. Levey graduated from the University of Michigan and received an MD and PhD (immunology) from the University of Chicago. He then trained in neurology at Johns Hopkins University and in molecular biology at the National Institutes of Health. He joined the Johns Hopkins faculty in the Departments of Neurology & Pathology and came to Emory in 1991. His past positions at Emory include director of graduate studies for the Neuroscience PhD Program, founding director of the Emory Center for Neurodegenerative Disease, and director of the Emory MD/PhD Training Program. Levey's awards include the Derek Denny-Brown Neurological Scholar Award from the American Neurological Association, the Heikkila Research Scholar Award from the National Parkinson Foundation and the Team Hope Award for Medical Leadership from the Huntington's Disease Society of America. He was inducted into the Johns Hopkins Society of Scholars, was named an ISI Highly Cited Researcher in the field of Neuroscience, and has consistently been listed among one of the Best Doctors in America. He serves as an advisor for many academic, private, and federal organizations, including the Department of Health and Human Services' Advisory Council on Alzheimer's Research, Care and Services. Robert F. Breiman is director of the Emory Global Health Institute and holds faculty appointments in the Hubert Department of Global Health and Department of Environmental Health at the Rollins School of Public Health and in the Infectious Disease Division of the Department of Medicine at Emory University School of Medicine. Breiman's principal research and policy have focused on issues related to preventing mortality, childhood pneumonia and enteric diseases, immunizations, and urbanization in Africa and Asia. He is the principal investigator (PI) and executive director for the Child Health and Mortality Prevention Surveillance (CHAMPS) Network), a new, long term global health surveillance network, funded by the Bill and Melinda Gates Foundation (BMGF), designed to characterize and provide crucial data for preventing childhood mortality in Sub-Saharan Africa and South Asia. Before joining Emory, Breiman worked at CDC for 26 years. From 2004-2013, he was based in Nairobi, Kenya as the director of US CDC-Kenya's Global Disease Detection Division, and for the final three years in Nairobi as overall director of CDC-Kenya, CDC's largest overseas field operation. He developed surveillance systems for infectious diseases in urban (Kibera in Nairobi) and rural (Lwak in Siaya County) settings, with research and publications on a wide array of topics, including typhoid fever, pneumococcal, influenza and other respiratory diseases, shigellosis, rotavirus and other diarrheal diseases. In 2004, Breiman helped start the Kenya Field Epidemiology Training Program (FETP), which has since become one of the world's most successful FETP programs. He mentored numerous Kenyan trainees and staff who subsequently became leaders in public health for the Kenya Ministry of Health and World Health Organization (WHO), as well as resident advisors for programs in Nigeria and Rwanda, and as CDC-Atlanta staff. Before moving to Kenya, Breiman was director of the Health Systems and Infectious Diseases Division and head of the Programme on Infectious Diseases and Vaccine Sciences at the International Center for Diarrheal Disease Research in Dhaka, Bangladesh (ICDDR,B), He was director of the National Vaccine Program Office for the US Department of Health and Human Services from 1995-2000 and was chief of CDC's Epidemiology Section of the Respiratory Diseases Branch from 1989-1995. Breiman is chair of WHO's Immunizations and Vaccines Implementation Research Advisory Committee (IVIR-AC). In addition to his work on CHAMPS, he is also the PI for the Rotavirus Immunization Program Evaluation in Kenya (RIPEK) project, a grant funded by Gavi, the Scientific Advisory Process for Optimal Research on Typhoid (SAPORT) Burden of Disease Project, funded by the BMGF, overseeing two large multicenter typhoid fever disease burden projects in sub-Saharan Africa and South Asia. He is the PI for a multi-center study, in collaboration with investigators from the UK Sanger Institute and CDC, to evaluate the pneumococcal genome over time to assess whether pneumococci have evolved in response to pneumococcal immunization programs, potentially resulting in changes in vaccine effectiveness. Breiman received his MD from the University of Arizona and completed his internal medicine residency, chief residency and infectious diseases fellowship in the UCLA system. He is Board Certified in Internal Medicine and Infectious Diseases, is a Fellow of the Infectious Diseases Society of America, a Fellow of the American Society of Tropical Medicine and Hygiene and a member of the American Epidemiology Society. He has authored over 350 scientific articles and one book. The Institute of Medicine (now the NAM) was established in 1970 under the charter of the National Academy of Sciences to advise the nation on medical and health issues. The newly elected members raise NAM's total membership to 2,127 and the number of international members to 172. With the election of Levey and Breiman, Emory currently has 25 members in the IOM.